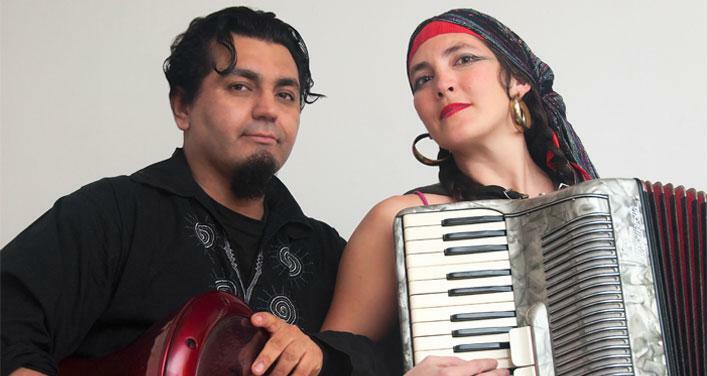 The duo Gorkata plays original compositions with accordion, darbuka and the singing style of gypsy music. They are influenced by the folklore of Eastern Europe and the Middle East. Kata, from Quebec, is accordionist and Gorka, from Mexico, is a percussionist. Both constitute the core of the project Gorkata, born in 2006 in Chiapas. Kata, after studying classical piano at the Conservatoire de musique de Montreal, decided to travel and discover in Mexico the instrument that was going to be her passion: the accordion. She participated in the project Fraktal-Avatara between 2006 and 2010. Over the past two years, she has played with the orchestra Baraka, a set of classical Arab music. Gorka learned drums with master like Bemba Bangoura and Kounabanan Condé from Guinea, Francisco Bringas from Mexico and Shahanka Bakshi from India. Gorka is playing the darbuka, djembe, rik and the table for more than 12 years. Gorkata plays an interdisciplinary fusion of music. They have performed in different shows in theater, performance, live painting and circus. Over the last four years, the duo Gorkata distinguished himself in the field of gypsy and tribal dance in Mexico. Now based in Montreal, they share on stage their emotion with rhythms and imagination. A colorful musical living patchwork!